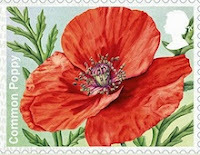 Office branches (from 24 October), and the Post and Go Poppy stamp will be in use again, though not from the same date at all locations. A new printing with R17YAL** (thanks Frank) code has already been offered for sale on eBay. Post Office branches and Royal Mail Enquiry Offices should have the Poppy stamp replacing the Union Flag from Tuesday 24 October. ** Comments include information that the Museum and Enquiry Office machines have 2015 printings and the small rolls for these machines have NOT been printed with R17YAL code. RM seem to have forgotten machine M010 at Norwich Enquiry Office: we must assume that if anybody wants to use it they will add the Poppy stamps. † - The Postal Museum has confirmed that this will be for all values. § - Not Doncaster as in RM advice. * - Not Croydon as in RM advice. ≠ - Yes, having been there I should have remembered this change which occured so long ago that you would have thought that the RM team responsible would have known! "13 November: 2014 Post and Go Winter Greenery: Stamps (2 x 1st Class, 2 x 2nd Class). Post Office Limited (POL) Self-Sservice Kiosk offices and selected sites POL only." Quite what 'selected sites POL only' means I don't know. As far as I know all sites which are not branch SSKs are Royal Mail (controlled), eg at Museums, so I have sought clarification on this as well. Thanks to RW I can now show images of the 2nd class CL17S Winter Greenery stamp, and the embargo label from the 1st class roll. Why are some of the dates for the introduction of the new Poppy shown as the 20th October and some as the 24th? The machine M006 at Croydon Delivery Office has now gone. There is also a machine at Windsor Delivery Office and this is machine No. M005. Has anyone seen the new Poppy self-adhesive counter sheet? This has a 'Sell date' which is shown as the 23rd October. I can't answer the dates question, but it does give enthusiasts the opportunity to go to two different places on different dates. The Croydon machine was M005, not M006; Doncaster seems to still have M006; but 'll notify the people who should already know that they have wrong details for Croydon/Windsor. Have you seen the new Poppy sheet - and has it got the year as well as the date? 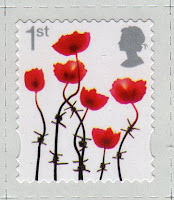 Postal Museum replacing Machin wih Poppy. Presumably this means the Machin 50 1st class strip - will the Poppy be 1st class only, or will it revert to the standard Collector's strip ? There's no reason why the Poppy should be 6 x 1st, so I assume it will be 6 values. The Machin 50 set is 6 different, hence 6 x 1st. Ian - the Post & Go Poppy has R17YAL, as on Mail By Air, not M17L. Windsor DO has machine M005. See that P&G Winter Greenery (2014) is being reintroduced on 13/11/2017 according to Philatelic Bulletin. Has this issue been reprinted with a 'R17YAL' year code ? Chris - yes, I've seen them. 2nd class is CL17S and 1st class is R17YAL. Believe it is. Still dispensing Hibernating Animals at the rate of two or three transactions a month! I've been told today that Winter Greenery is now in Norwich DO's M010 - but the 2nd class is misaligned and 'not cutting well'. Unbelievably, Windsor DO had poppies MA15 (in from last Thursday apparently). I understand MA15 may have been in other DO machines too. How ridiculous. Was it too difficult to supply R17YAL ? There’s Absolutely no point sending new stock to offices which have ample old stock. What you are suggesting could have resulted in those offices using 2017 stock first and then reverting to old stock, and there would have been complaints about that, with justification. Ian - Windsor DO (k/a Queen Elizabeth II DO) only opened in April this year, so they were sent old stock - that was my grumble. As far as i am aware no new year code was put on the smaller coil that museums & enquiry offices use, I will be pleased if it works out that way. We do not need more varieties. Interesting (but trivial?) to note that the 'O' of ROYAL on the Poppies is replaced by two characters '17' to give 'R17YAL'. Would have expected 'R17AL? (Compare CL17S). Yes, I noticed that too - odd isn’t it? I don't think old or new stock really matters on this issue as whatever is in the machine will be new as far as the Postal Museum is concerned because of the overprint. The Poppy and the Machin 2nd class will be replaced on the 13th November 2017 with the Christmas issue for this year so the last day of the Poppy at the Postal Museum will be the 12th November 2017 and not the 23/11/17 as given in the table. The Galleries in Bristol told me just now that they not having Winter Greenery available until tomorrow! They apparently have the new stock but maybe the Monday release may have caught them out?